Though this isn’t strictly a Thermomix blog, I do like to talk about the TM31 every now and then. I have been a proud Thermomix owner for about two and a half years and it was love at first sight. Actually, it was love before sight. A mum at my toddler’s playgroup who later became a good friend of mine, was telling me about this fabulous kitchen contraption which was kind of a food processor, kind of blender but so much more. I immediately became intrigued, I also knew I wanted one at any cost (almost). Since I have a history of becoming somewhat obsessed with the object of my desire, I got hold of a Thermomix consultant that afternoon. She was very helpful and informed me that the machines were German-made, unavailable in shops, and only available through in-home demo’s with an authorised consultant. Furthermore if I was interested would I be able to arrange four interested parties to spend two hours on a Saturday afternoon watching the Thermomix in action? I replied unlikely because I didn’t know anyone beside myself interested enough to spend almost $2k on an appliance. She must have sensed my desperation because she offered to do something she didn’t normally, and that was to put on a mini-demo for me on the proviso she was guaranteed a sale. I said done. So my husband and I had a mini-demo with a lovely consultant called Annie who ran us through the machine and we both agreed we would benefit immensely from owning one. On one condition set by my husband: that I would have to sell as many non-essential kitchen gadgets as possible to help fund it. It was the most bittersweet deal imaginable. I wanted the Thermomix but I’d have to sell my KitchenAid stand mixer (her name was Ruby), the ice cream attachment, my forest green Le Creuset casserole pan and the set of Global knives. I also sold the Braun blender and the food processor. The husband (the money man) was pleased. A week later the TM arrived. I had more fun with it than the time I was set loose on Key West Florida thirteen years ago after divorcing my first husband. I made more food than we could eat so my neighbours, friends and family were given a steady supply of Thermomix creations so that I could make more. I originally used the Thermomix cookbook provided as a guide and eventually started writing my own recipes. One of them is this vanilla custard recipe. Those who own a Thermomix will know the Everyday Cooking cookbook which you receive with the machine when you buy it. Overall the book is pretty average, some recipes don’t work, some are very basic and some are just a bit weird. But it does set you up with a basic understanding of the cooking principles behind the machine. The custard recipe however has had me baffled because some people love it, but in my opinion it’s just very average. The quantity of sugar and corn flour alone leave me cold because I can’t understand who wants to eat an overly sweet custard loaded up with so much corn flour it solidifies into jelly. Each to their own I suppose. So I came up with this recipe based on a traditional stove top recipe I learned from my mum. Except I wondered what would happen if rather than warming up the milk and cream with the vanilla bean and adding it to egg yolks whisked with sugar, I just threw it all in the jug and turned the TM on? My idea worked, and the custard, after a few tweaks to the cooking time and temperature (and lots of testing) I deemed to be pretty good. No lumps, no splitting, no weird consistency, just delicious vanilla custard. 1. 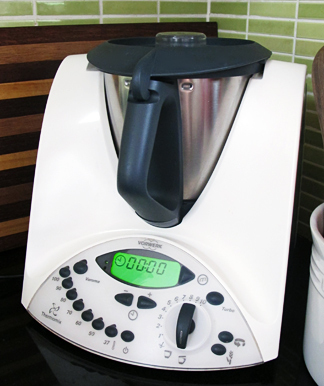 Place all ingredients in order from top to bottom in the jug of a Thermomix. 2. Put lid on TM and cook for 10 minutes at speed 4, 90º on reverse (so the vanilla bean doesn’t end up in tiny little pieces). Custard will appear runny at first and will become less so after cooling. Remove the vanilla bean and serve. See? Easy! Goes beautifully with the Boozy Christmas Gluten-free Christmas Plum Pudding recipe. On a footnote, I love my Thermomix and wouldn’t be without it. I use it a lot, though there are some things I don’t cook with it preferring the traditional way (for example beating egg whites with a $20 hand mixer). I realise there is a lot of criticism of the TM out there, mainly because of the cost but I honestly think it’s worth it. Why? Because it is a real time saver if you’re cooking for a family (as in my case) plus a plethora of other reasons including the fact it can whip up killer meals like soups, risotto and curries. I even bought a second jug to keep my sweets separate from my savoury after the great roasted red capsicum-scented custard fiasco. I often get asked if I had my time again would I buy it? Yes, absolutely. But I’d keep my KitchenAid! This shot is made up entirely of cute little op-shop purchases from my local Salvo’s and Lifeline stores. I love the stoneware canister with the word vanilla in German. There was a whole collection of vintage stoneware spice canisters with German names on them for $1.50 each which I would have bought had I figured out where to store them, but I settled on just one. I have a penchant for vintage linen and adore little doilies and embroidered cloths such as the one pictured with grape vine leaves and berries. The background is a vintage Chinese timber coffee table and the wall is a painted piece random groove wall paneling I found in hard rubbish council clean up. The only light used in this image is window light. thanks so much – I am looking forward to trying this recipe as I agree with you that the EDC custard recipe is not quite right. Just a comment – one of the best things about the Thermomix is the measuring tool (saves all that washing up of cups/teaspoons and tablespoons) perhaps you could think of using grams next time you are investing recipes. This is fantastic custard. So much better that the EDC one. My only custard-recipe from now on. Thank you. Thank you so much for sharing. It was beautiful and so much better than the custard in the EDC. Definitely saving this one! Can’t wait to try this on Christmas Day. How many serves would I get from this? If I need more would I simply double all the ingredients? I’m getting my thermie tomorrow and I don’t have any vanilla beans or paste could I use vanilla essence? Tanya, best custard ever. Thank you for sharing. My boys loved it and so did I.
Btw. I agree with you regarding the Everyday Cookbook; it is very hit and miss…. Thank you so much, the custard was perfect – I sometimes worry about trying something new that it will need tweaking in some way but this was just perfect and tastes divine!! Just wondering have you tried turning this to ice cream. I’m making this now but didn’t put all the ingredients in in order. Oh I hope it works!! I was very sceptical about the machine until I went to a demo and within 5 mins had to have one !!! It is just so good and it gets used all day for so many recipes. Velouté and béchamel are a dream in a Thermomix. And we always keep frozen fruit on hand so we can whip up a sorbet in a flash. Thank you for this. Delicious and so much better than the EDC version (tasted creamy, not too eggy). Just wondering how long it keeps for once made? I keep custards and mayo’s for about 4-5 days max as they contain eggs. Great work thanks, I modified slightly, leaving out the cream and adding an extra cup of milk and I used whole eggs and it was delicious. Thank you! This was the best custard I’ve ever had from my Thermie. I replaced the sugar with rice malt syrup as I have to watch my insulin but even with that switch, it was the perfect custard. Thanks again for sharing. Have got the older version of Thermomix so no reverse gear but I just made this 100% cream no milk and no cornstarch with vanilla paste rather than a pod and it is just amazing. Lovely and thick and as it is for an icecream base I am struggling not to eat it straight from the jug – not sure it will last until it goes into the icecream machine because it has to chill down which gives me far too much time to eat it! Thank you for a great recipe. One day I might be able to upgrade to a TM31. My 3 year old loves custard – the store brought kind with loads of nasties in it – but he would turn his nose up at the EDC version every time I made it for him (not that I really blame him! ), so I went searching and stumbled across your recipe. My 3 year old is currently tucking into a bowl of this custard, declaring it “delicious!”. 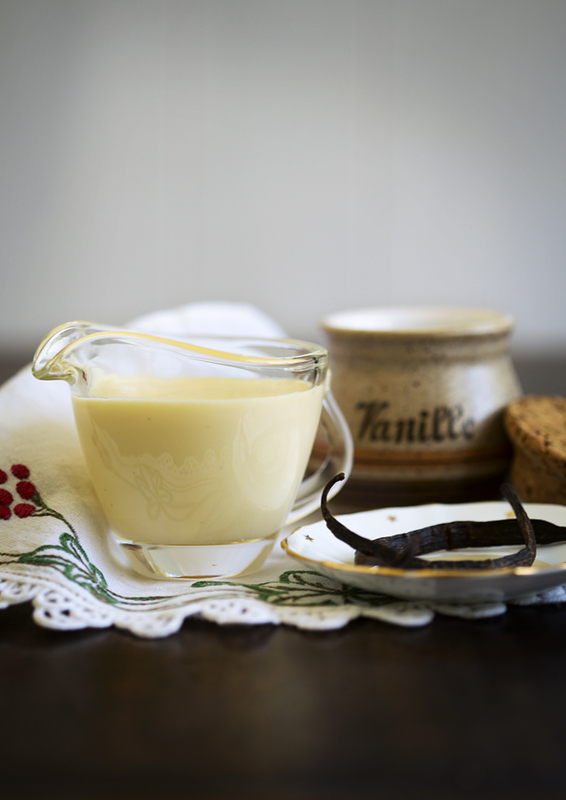 This is my new go-to custard recipe, and I can’t wait to whip some up for christmas! Hi Tanya when you say you should have kept your Kitchen Aid, are you talking food processor or upright mixer? Just interested as I am thinking of selling mine.